The Meal Centre provides 300 nutritious meals per day seven days a week to anyone that is hungry. People attend the Meal Centre for a variety of reasons. Others have struggles and just need to be around people – not even to talk – just to be with someone. 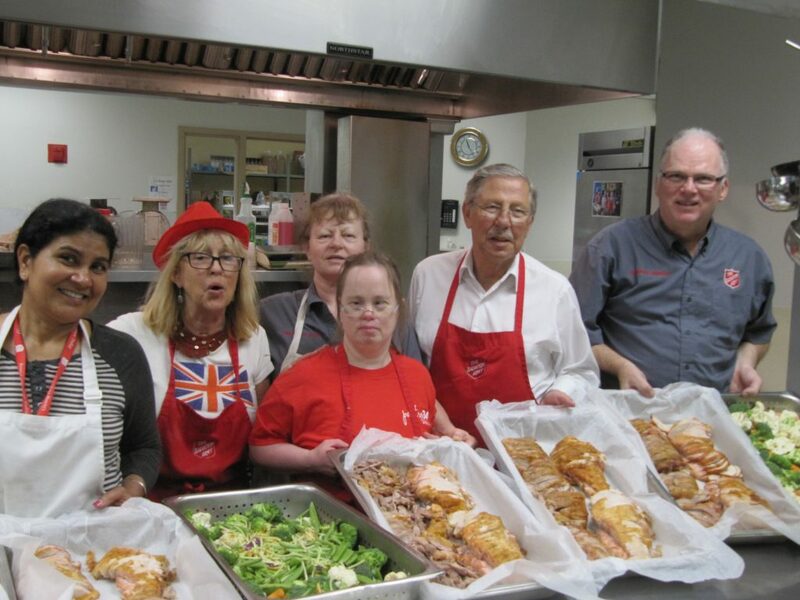 We employ professional cooks at the Meal Centre. There are usually about 6-7 volunteers every day who help with sorting, cooking, and clean-up. Our program for feeding the hungry is strongly supported by local businesses that donate so much of the food, and it is heavily dependent on the volunteers who willingly sacrifice their time. Each morning, our driver volunteers report to various businesses in town to collect surplus baked goods, produce, and broken cases. When the trucks arrive back at the Centre, the cook will look at perishables that need to be used right away and may adjust the day’s menu based on what has come in. Each day, all the donated goods have to be sorted. Five or six volunteers spend time sorting and bagging bread products, fruit and vegetables. These will be available to people as they leave the meal centre after lunch. They can take a bag of vegetables and a bag or baked goods. As well, some families who don’t use the Meal Centre come just to get food that will help stretch their grocery money. What could be worse than being alone and hungry on a holiday? Each year, we serve traditional, sit-down dinners to several hundred people at Easter, Christmas, and Thanksgiving. These events help make the holidays a little more joyful for those who come. Come at 8:30 for the Super Sunday service before the meal.